William R. McGuiness was appointed Administrative Presiding Justice of the First Appellate District on January 28, 2002. He is also Presiding Justice of the First Appellate District, Division Three, having served in that position since December 21, 1998. Previously he served on the Alameda County Superior Court from 1986 until elevated to the Court of Appeal in 1997 as an Associate Justice of the First Appellate District, Division Four. As a Superior Court Judge, he discharged a broad range of criminal and civil judicial assignments. He was elected Presiding Judge of the Court by his colleagues in 1994 and 1995 and was Chair of the Alameda County Superior Court Executive Committee and a member of the Judicial Council Trial Court Presiding Judges Standing Advisory Committee. He served in the United States Department of Justice in Washington D.C. as a Deputy Associate and Associate Deputy United States Attorney General from 1983 to 1986. In 1982 he was a consultant to the United States Department of Justice and counsel to the President's Task Force on Victims of Crime. He commenced his legal career in the Alameda County District Attorney's Office as a Deputy District Attorney from 1973 to 1980, and served as a Senior Deputy District Attorney from 1980 to 1983. Justice McGuiness has represented the Court of Appeal, First Appellate District, the Alameda County Superior Court, the United States Department of Justice, and the Alameda County District Attorney's Office on various committees and educational panels throughout his career. He has also served as a member of the American Inn of Court of Alameda County (1996-1999), California Judges Association Appellate Courts Committee (1998-2002), Judicial Council Appellate Indigent Defense Oversight Advisory Committee (1998-2002), Judicial Council Administrative Presiding Justice Advisory Committee (2002-present), and as Chair of the Judicial Council Subordinate Judicial Officer Working Group (2001-2002). 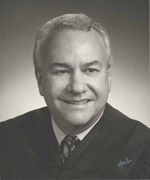 Justice McGuiness is a graduate of Santa Clara University ('68) and the University of San Francisco School of Law ('72). He and his wife Mary, an elementary school principal, have two adult children.